LOS ANGELES (AP) — Several hours after owner Donald Sterling was banned from the NBA for life, the Los Angeles Clippers sprinted and soared through a playoff game as if a weight had been lifted from their collective shoulders. The Clippers finished a tumultuous day with a 113-103 victory over the Golden State Warriors on Tuesday night, leaving their home court to high-fives and standing ovations from fans enthralled by the prospect of watching an NBA title chase without Sterling in his front-row seat. "We have a tough locker room, all of us are tough, but it almost brought out tears to your eyes just to feel the support from the fans," said Chris Paul, the Clippers' star point guard. NBA Commissioner Adam Silver delivered the extraordinary punishment to Sterling after a recording of racist statements by the real-estate mogul was made public several days ago. The ban is one of the harshest penalties in the history of U.S. sports, but was met with near-universal acclaim from fellow owners, civil rights observers and NBA players who strongly contemplated a playoff boycott if Sterling wasn't punished harshly. "The views expressed by Mr. Sterling are deeply offensive and harmful," Silver said while announcing his first major action as the league's commissioner. 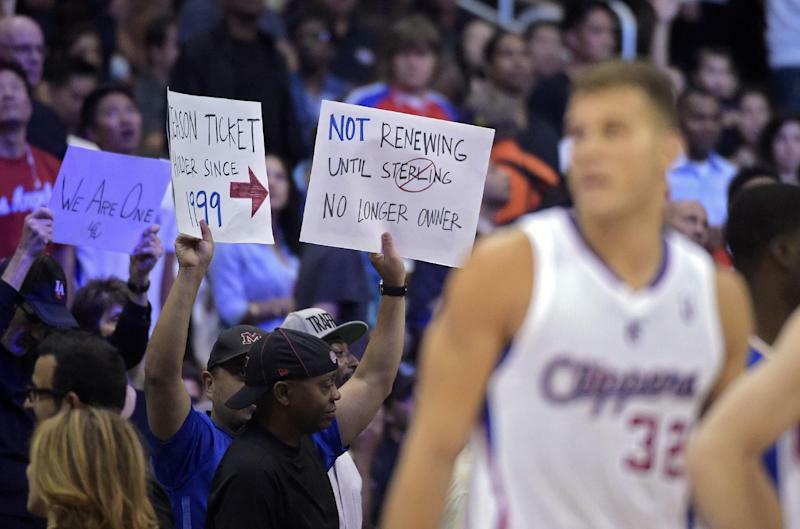 "That they came from an NBA owner only heightens the damage and my personal outrage. Sentiments of this kind are contrary to the principles of inclusion and respect that form the foundation of our diverse, multicultural and multiethnic league." Sterling was fined $2.5 million, the maximum allowable under the NBA constitution. Silver also will urge the NBA's board of governors to compel Sterling to sell the Clippers, and if three-fourths of the other 29 owners agree, the league's longest-tenured owner almost certainly will be forced to give up the team he has owned since 1981. Sterling made no public comment about the ban, but the owner is among the most litigious people in sports. Team spokesman Seth Burton said in an email that the Clippers had no plans to issue a statement from Sterling on Tuesday, but the franchise released a statement "wholeheartedly" supporting Silver's decision. While the league waited to see whether Sterling will fight to keep his team, the Clippers got back to basketball with a flourish. Two days earlier, with news of Sterling's comments still fresh, the Clippers dumped their team warmup jerseys in a pile at center court in Oakland in a gesture of defiance against their owner before losing Game 4 of the series. After Silver's announcement and an emotional team meeting, the Pacific Division champions methodically beat the Warriors to take a 3-2 series lead. Los Angeles is on the brink of just its third playoff series victory since Sterling bought this star-crossed team nearly 33 years ago. 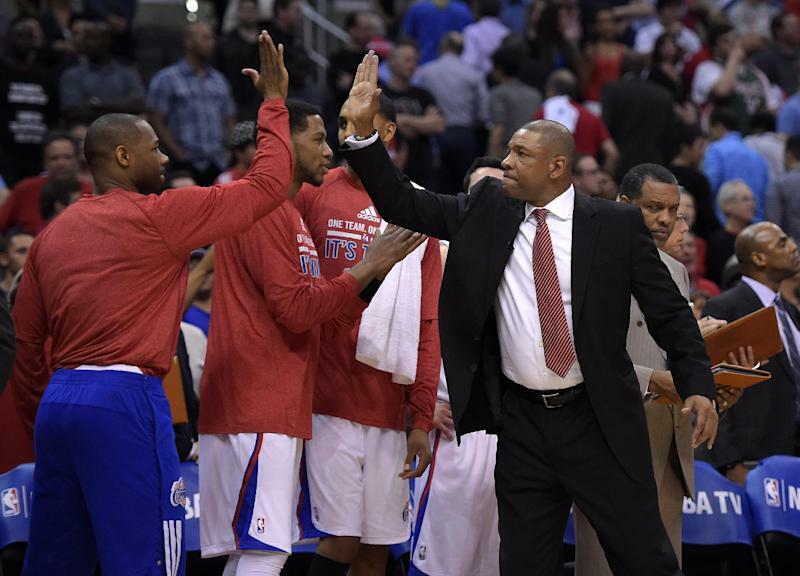 "I was really proud of them," Clippers coach Doc Rivers said. "I thought they were tired a lot tonight. I thought you could see them getting tired from all the emotional baggage over the last four days. They had great mental toughness tonight." Even while Sterling contemplates his next move, the Clippers organization rushed to distance itself from Sterling. Shortly after Silver's announcement, the Clippers' website featured only a black screen with a simple message: "We are one." The mantra was repeated by the team's public-address announcers and chanted by their fans several times during their playoff game. Sterling is banned from Staples Center and the Clippers' training complex in Playa Vista, a beautiful $60 million facility constructed by Sterling. He is prevented from participating in any decisions by the Clippers, or from any league activity, including board of governors meetings. Most of the advertising signage at Staples Center was either covered in black cloth or removed for the game. Many sponsors dropped the Clippers or re-evaluated their relationships with the NBA over the past several days, and Silver is hopeful they will return with Sterling's departure. Sterling's long-estranged wife, Rochelle, watched the game from a seat in the lower bowl, not in the courtside chairs usually occupied by the couple — or by Donald Sterling and a string of young female friends. One of those friends, V. Stiviano, was the other voice on the recordings made public last week. Silver said Sterling had confirmed his voice was on the recordings. He criticized Stiviano for posting pictures of herself online with black athletes Magic Johnson and Matt Kemp. "Don't bring him to my games," Sterling said of Johnson, the former Lakers star and current Los Angeles Dodgers owner. "Yeah, it bothers me a lot that you want to promo, broadcast, that you're associating with black people. Do you have to?" Despite the urgency of the potential move, Sterling seems almost certain to get the highest sale price in history for an NBA franchise if he is indeed forced to sell. After decades of incompetence under Sterling's watch, the Clippers are now a successful team located in glamorous Los Angeles — and they're about to get much more valuable when they sign a new broadcast deal in 2016. After the news of Sterling's comments broke last weekend, Rivers clearly questioned whether he would stay with the team that pried him away from the Boston Celtics a year ago with a lucrative contract. The championship-winning coach, who is black, said he still hadn't made up his mind before Game 5. "I had given it zero thought, as far as that goes," said Rivers, who briefly played for Sterling with the Clippers. "Obviously, Adam's decision, if there was going to be one, makes mine easier."